Due to the nature of these types of vegetation you can’t just throw any kind of bait in it and work it effectively, but the weedless frog is designedto fish in this kind of cover. In order to fish the weedless frog bait effectively in this type of cover, you need the right equipment. I use a 7’ Gloomis (model # MBR844C) heavy power, fast action rod; this rod has no tip action and excellent backbone to muscle fish out of the vegetation. The McCoy spectrum super braided lines in 50 lb. test is a smooth line and slick to the touch, but has the power to pull in big bass out of the heaviest of cover. I use the Shimano Chronarch reel in a 6:3:1 gear ratio; the higher gear ratio helps pick up the slack in the line and allows you to get the fish’s head turning quick, getting it out of the cover. Spro Bronzeye Frogs are my primary bait of choice. These frog baits are made with a heavier plastic so you can throw them farther than most, and with a heavy duty Gamakatsu Super line double hook, this frog presentation is a big bass’ worst nightmare. My backup bait is Stanley Ribbits. I can work these baits like a buzzbait, and with the action legs I can cover water a lot faster than I can with the Spro. Equipped with a 5/0 Gamakatsu Superline hook, I get maximum hook setting power with my set up. You want to throw these baits right in the heart of the cover, and work them in and around the cover. The biggest challenge people have is the hook set on these lures “YOU NEED TO FEEL THE FISH ON THE LINE NOT THE ROD “. So many people set the hook when they feel the fish on the rod, but that doesn’t mean the fish has the bait in his mouth. You need to make sure you feel the bass on the line before you set the hook. 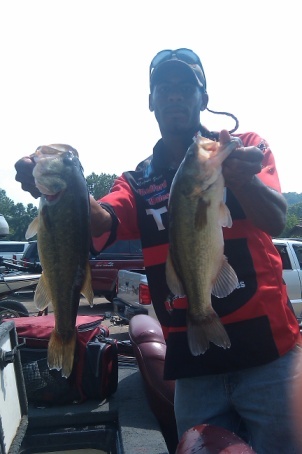 Now when you set the hook keep your rod tip high and the bass on top of the grass right away. If you use a standard worm hook set where you take up your slack the fish will take you deep into the cover, and getting him out at that time is slim to none. Use these tips & get the equipment that is designed for frog fish and I guarantee you will have great success @ froggin!